I don’t think I’ve read any YA books dealing with Greek mythology—I haven’t even read the Percy Jackson series. With that in mind, I completely understood the book and had no issues with having to know the myths inside and out beforehand. I enjoyed this book. It is somewhat long, but I liked the plot and main characters. I think it took me about a week to read since I’ve been busy with school lately and read a hardcopy of the book. I had about 200 pages left when it started becoming hard for me to put down the book. Haden is a disgraced prince from the Underrealm. The only way for him to earn his father’s approval and birth right back is to journey to the mortal world and search for Daphne Raines, the only person who can find Hades’ lost key. Daphne Raines has lived in a small town all her life with her overly protective mother. She’s a music prodigy and the daughter of a rockstar. After seeing her father only a handful of times throughout her life, he suddenly pops back into it and takes her to Olympus Hills where she’ll attend the high school there and be apart of its stellar music program. Haden starts off a little jerkish and creepy, but definitely redeems himself. He’s practically Zuko from Avatar: The Last Airbender. Daphne is tough and stubborn. She definitely doesn’t put up with Haden and his destiny nonsense as she sees it, and it’s him who falls in love with her first. One character I didn’t like too much was Tobin. Daphne meets him during her audition for the music program, and they become best friends right away. Tobin kind of bothered me throughout this book and I hope he’ll improve in book two. The book had a pretty good pace and just the right amount of details. I liked both worlds Bree Depsain created and I’m interested in how she’ll add more to them in the coming books. I liked Bree’s ideas and how she incorporated parts of the myths into the story. I’d recommend this book if you like Greek mythology, especially if you like it with a modern twist. I’ll definitely be reading the second book, The Eternity Key, soon. Now, giveaway time! 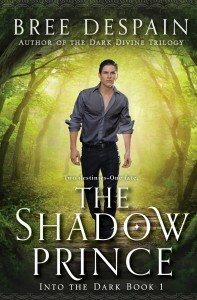 Enter below for a chance to win a SIGNED copy of The Shadow Prince + some Into the Dark swag. I do, too! Thanks for commenting, and good luck!